The father, mother and daughter sit together, waiting for an appointment. Dad’s Timex-clad wrist rests on his knee, black cell phone extended within reading distance. 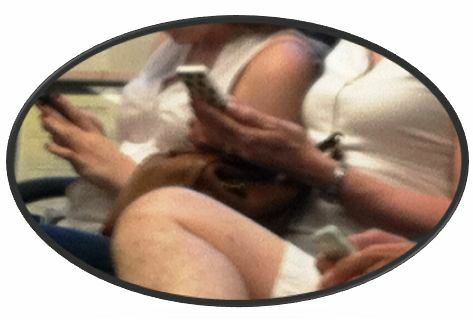 Mom, sitting rigidly next to Dad, smiles gently at the white smart phone held inches from her belly. A younger version of Mom: red curly hair, white shirt, sits slumped in the waiting room chair, thumb-punching letters and numbers into her sticker-covered best friend. The American family: arms touching, a world apart. This scene isn’t much different from a family waiting for an appointment in the ‘80s. In the ‘80s the family probably had a shoe-box size car phone, but in the waiting room they would have sat side-by-side with magazines and books, arm touching arm, still a world apart. It was in the ‘80s that the Walkman became popular.2 I know, because I blame it for the first of many breakups with guy friends that didn’t understand that we were on a date. Carl3 had invited me to join him and some buds to see the UNH Hockey Team play Team USA. This wasn’t just any Team USA, this was the Team USA that two years earlier had performed the miracle of taking down the unstoppable U.S.S.R. in the Olympic semi-final and then extended its unbeaten streak by winning the Gold in its final against Finland. This, I knew, was a real date. We piled onto the bus that would take us one hour away to the little skating arena in Concord, NH. Women were making New England glamor statements in cable knit sweaters and flipped back hair accented by earmuffs. Men were reliving the miracle game and one-upping each other with player stats. I sat down next to Carl, probably yammering on about where I was when Mike Eruzione, slapped his shot into the back of the net.4 He nodded and shared a few thoughts. Then in the brief silence that follow, out came the Walkman. He placed the headphones over his ears, leaned back into the seat, shut his eyes, and I was alone. I’d say I was heartbroken, but we were friends, so perhaps that’s not true. But I was puzzled. How was that acceptable behavior? Why was it okay for him to be with a group of friends and recede into his music? With the proliferation of cell phones at social events, I wonder the same thing today. Mid-conversation, people will pause, their pockets buzzing, to retrieve their phone to read their texts. Adults try to be discreet; kids keep talking while they type their replies. Am I the only person to feel devalued when mid-sentence a coworker pulls out the phone to check texts? Am I the only person who gets annoyed if I am conversing with my husband and he answers his cell, just because it rings? Hasn’t anyone else ever stood in front of a cashier, back turned while he texts his friends (or Mom, or boss)? When this happens, I have actually called to place my order, knowing that while the real life person can be ignored, the cashier will jump to answer the phone. You are just dozing off after a long evening and the buzz of the cell awakens you. You are crafting a project update to your boss. Your cell lights up and your concentration is broken. Staff meeting is mid-way through and you slip the cell out of sight to read and text. Driving, you listen to music. But then you hear the unmistakable pause or jingle of a text received, so you reach over. In each of the situations above, the cell phone is interrupting you, fragmenting the ability to get an important task done completely and safely. We believe ourselves masters of multitasking, but each shift is a transfer of attention. Our brains do not have the ability to process both tasks simultaneously; rather like a multitasking server, we process threads one at a time. The more threads, the more power is needed to manage the processing and less is available for completing critical tasks. In “Warning: Your Attention is Under Siege”, Tony Schwartz writes, “research suggests that when you shift your attention from a primary task to take on another one – say answering an email – you’re increasing the time it will take to finish the initial task by an average of 25 percent.”5 A recent study at George Mason University supports Mr. Schwartz’s statement. “[Cyrus] Foroughi, with coauthors Nicole Werner, Erik Nelson, and Deborah Boehm-Davis, designed a study assessing how varying levels of interruption affected writing quality in an essay project” (Newswise.com).6 Foroughi, et al, saw a significant drop in quality and number of words in the essays of the people who had experienced interruptions. And what happens when our daydreams are replaced by a constant stream of text and instant messages? What potential new creations are lost because we prevent boredom with Tweets instead of allowing our brains to rest and float over a day’s events? Currently researchers are debating this question. Some believe that daydreaming is essential to progress and growth. Others believe that it is a breakdown in the Executive functions of our brains.7 I believe that both are on the right track and hope that research will continue, because the one thing we do know is that the proliferation of attention-seeking devices will continue. There are at least three kinds of daydreaming: 1) daydreaming that occurs during Chemistry class or in a board meeting, which is more like Mind Wandering. 2) Problem Solving daydreaming that focuses on a specific problem and ruminates over its components while mowing the lawn, showering or walking, and 3) the Creative Daydreaming that is part of your leisure time; that time spent in a meditative state when we allow our thoughts to meander along an unknown path. Mind Wandering is Creative Daydreaming gone bad, and this I believe is due to an undeveloped, or failure of, the Executive functioning of the brain. This was the daydreaming I excelled at in High School. When the periodic table of elements was discussed, I would dream about the various greens in the trees and where the path in the woods leads. I could have been texting or reading emails instead of floating among the trees. Either way these activities stood in the way of the task at hand. I thought that Chemistry was beyond my abilities, but my real issue was lack of control over the Executive functions of my brain. In my last year of college and then in graduate school, I had gained some control of this area of my brain and as a result, my grades soared. However, unless I am vigilant, I still succumb to Mind Wandering. As detrimental as Mind Wandering can sometimes be, I believe that Problem Solving and Creative Daydreaming should be nurtured. Amy Fries discusses the Problem Solving type of daydreaming, describing how she was obsessed with a tricky fiscal issue, “In this case, I got my “aha” moment in the shower.”8 Ms. Fries then cites a 2009 University of British Columbia study that confirmed that this type of daydreaming uses the Executive Functions, recruiting complex problem solving regions of the brain. I believe that giving ourselves time to let problems float in and out of our thoughts, allows us to see patterns from our memories that can be applied to the problem at hand. While companies should encourage the daydreaming that leads to solutions, it is difficult for a supervisor to tell the difference between an employee that leans back on her chair, feet up on the desk, ruminating over a challenge, and the same posture in an employee planning her night out on the town. In companies today, productivity is synonymous with being busy. But it is Creative Daydreaming that is most at risk. Rarely do I see people sit on a park bench or in a waiting room, hands behind their heads, staring at clouds or the dots in the ceiling, just thinking. Instead, they have their cells twitching in their hands as they search app to app looking for something to break their boredom. For those that do look deep in thought, the cell is on their knee or in their pocket and the second it buzzes, their hand reflexively reaches out. Set your cell phone down and step away. Go outside and lie on the ground or on a hammock. Completely unplugged, stare at the clouds. Try this for five minutes. This is Creative Daydreaming, which can be restorative and refreshing once you remember the skill. I started my longer post with a stunning, relate-able quote from Beautiful Ruins, written by Jess Walter. I too awaken each morning, reach over, and take a digital hit from my cell phone. I look at the various icons and check their counts, disappointed if there are no red numbers floating over at least a few of them. Cell phones and electronics are here to stay, and I personally love being in such close contact with my friends and family. The challenge for me though, is to enjoy these digital interactions without letting them rule my work time, my family time, and my time to dream. Beautiful Ruins by Jess Walter. Chapter 2; Reprinted April 2, 2013. A Brief History of the Walkman. Meaghan Haire (7/1/2009). http://content.time.com/time/nation/article/0,8599,1907884,00.html. Warning: Your Attention is Under Siege. Tony Schwartz. The Energy Project blog (11/15/2010). http://theenergyproject.com/blog/warning-your-attention-under-siege. Say “No” to Interruptions, “Yes” to better Work. Newswise.com (7/14/2014). . The Power of Daydreaming: Wake Your Creative Abilities. Amy Fries (4/19/2010). This entry was posted in Health, Social Media and tagged cell phones, daydreaming, interruptions, Jess Walter, Mike Eruzione, problem-solving, Texting, Tony Schwartz. Bookmark the permalink. This is one of the reasons I meditate. Of course, creative or problem solving daydreaming doesn’t happen during such interludes, but disconnecting from the business of the world does. And it refreshes the mind!